Massage therapy is the assessment and treatment of the soft tissues and joints of the body by hands-on manipulation. It uses a system of strokes that include gliding, kneading, friction, pressure, tapping and vibrating. Massage therapy is used to reduce pain,	improve circulation and promote relaxation and stress relief. We have massage therapists on staff who are trained in a variety of massage modalities. The need for and benefits of	these massage therapies vary from patient to patient. Our massage therapists will help you choose the best massage method for your specific situation. Swedish massage: A system of long strokes, kneading and friction	techniques on the more superficial layers of the muscles, combined with active and passive joint movement. Deep-tissue massage: Releases chronic tension through slow strokes and deep finger pressure. It's called deep-tissue	massage because it focuses on the deeper layers of muscle tissue. Sport massage: A blend of traditional Swedish massage, stretching and shiatsu and focuses on muscle systems relevant to your favorite sports. Trigger point therapy: Applies concentrated finger pressure to	"trigger points" (painful irritated areas of spasm and pain in muscles). Myofascial release: A form of bodywork manipulation that seeks to rebalance the body by releasing tension in the fascia. 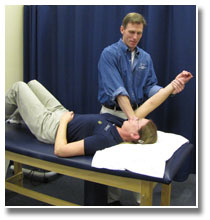 Long stretching strokes are utilized to release muscular tension. For full details on our therapeutic massages or to schedule an appointment, call Physical Therapy & Sports Rehab at 215-679-0105 in Upper Perk or 215-862-4195 in New Hope.